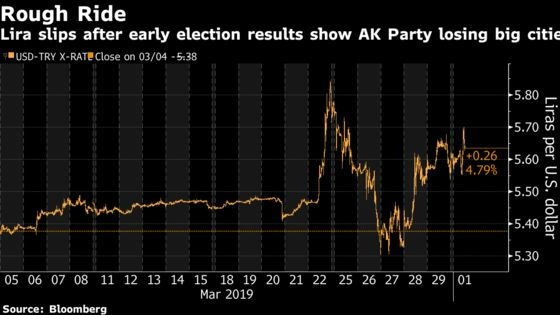 (Bloomberg) -- The lira swung between gains and losses as Turkey’s main opposition moved ahead of President Recep Tayyip Erdogan’s ruling AK Party in a closely fought contest for the nation’s largest metropolis after local elections loosened his grip on the nation’s key cities. The currency was trading 0.3 percent stronger against the dollar as of 3:26 p.m. in Istanbul after earlier dropping more than 2 percent. Overnight swap rates jumped to over 320 percent, a sign funding conditions in the offshore market remain tight after authorities orchestrated a short-squeeze last week to prop up the currency. Early results showed the opposition winning the capital Ankara and taking control of Mediterranean coastal cities from Erdogan’s alliance. The party has also taken the lead in Istanbul, Sadi Guven, the chairman of the nation’s High Election Board, said in televised comments on Monday. A former prime minister and ally of Erdogan had earlier declared victory in the race on Sunday. If the results hold, the setback for Erdogan’s AKP could fuel concern that authorities will trigger further currency weakness by pursuing expansionary policy aimed at rallying the party’s base. Local investors were seen buying small amounts of foreign currency in early trading but were sellers by the afternoon, according to two traders who declined to named, in line with policy. In a short address before departing for a victory speech in Ankara on Sunday, Erdogan said Turkey has an “important reform agenda” ahead and conceded that some municipalities may have been lost to the opposition. Turkey’s currency crash in August drove inflation beyond 20 percent, battered foreign-currency borrowers, and pushed the economy into its first recession since the global financial crisis as banks lost their appetite to lend. The central bank has signaled it will maintain a hawkish stance until the pace of price growth slows, but investors are worried that government policies could stoke an inflation rate running at four times the official target. Before Sunday’s vote, state lenders were already under pressure to prime the economy with cheap loans, while a series of tax cuts designed to boost consumer demand have put a hole in the budget. After the central bank’s decision to raise interest rates in September initially anchored the lira with the highest carry-trade returns in emerging markets, the currency has weakened more than 7 percent over the past three months, the most among peers after the Argentine peso. Persistent demand for hard currency from local investors has increased the weakness as they sought protection from inflation and a hedge against any turbulence following the elections. Households and companies have added around $28 billion to their foreign-currency deposits over the past six months, taking the total to a record. Data earlier this month showed the central bank’s net reserves dropped unexpectedly in March, adding to speculation that it was using the cash to support the currency. JPMorgan Chase & Co. said the drawdown was unsustainable and recommended investors sell the lira.